Zounds! Spaceman Spiff, Stupendous Man, the ferocious tiger Hobbes, and the rest of Calvin's riotous imagination are all included inThe Days Are Just Packed. Calvin, the irrepressible pint-sized tyrant, is always bursting with energy. And the volume's oversized 12-by-9 inch format provides Calvin's outrageous fantasies room to explode. 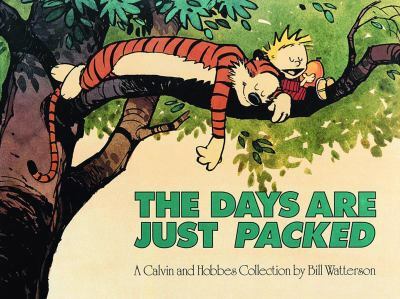 Dozens of Sunday strips are lavishly reproduced in color forThe Days Are Just Packed, along with Calvin's amusing weekday adventures.Watterson, Bill is the author of 'Days Are Just Packed A Calvin and Hobbes Collection' with ISBN 9780836217353 and ISBN 0836217357.